wolfSSL is at Satelilite this year! The Satellite experience includes networking opportunities, SGx, Tech Demos, a Startup Space, and an international resource center curated from the 15k+ attendees from over 100 countries who come together for this global show. Connectivity and aerospace professionals will lead discussions on the future of satellite connectivity and the changing market landscape, hundreds of industry peers will be exhibiting cutting-edge technologies to buyers in enterprise, finance, military and government, telecommunications and transportation sectors. For 2019, Satellite will be located in Washington, DC. More information about Satellite can be found here: https://2019.satshow.com. TLS 1.3 has a different handshake flow when using pre-shared keys and this impacts performance. This is the third part of six blogs discussing the performance differences observed between TLS 1.2 and TLS 1.3 in wolfSSL and how to make the most of them in your applications. This blog discusses how and why PSK handshakes are only similar in speed generally but faster when using DH style key exchange. For TLS 1.2, handshakes using PSK are defined in a separate document (RFC 4279). In order to fit in with the existing flow, a full handshake is performed. In TLS 1.3, PSK handshakes are the same as resumption handshakes. Therefore there is one less round-trip required for TLS 1.3. This change in flow has a significant impact on the performance of TLS 1.3. The amount of hashing and encryption/decryption has increased but losing a round-trip means that using PSK without a DH style key exchange is only slightly slower. On higher latency networks, the difference is trivial and the savings great. In TLS 1.3 using DH or ECDH with PSK results in the following handshake operations. So, the secret is calculated on the server after the ServerHello is sent. This means that the processing of the ServerHello and secret calculation on the client is happening at the same time relative to the server calculating the secret. The parallel secret generation resulted in, with client and server running on the same computer, TLS 1.3 being about 25% faster than TLS 1.2 when using DH. Using ECDH with P-256, TLS 1.3 is about 15% faster. It is clear that using pre-shared keys in a secure way, with DH style key exchange, is faster with TLS 1.3 in wolfSSL. The next blog will discuss use cases that result in the removal of a key generation from the list of expensive cryptographic operations in TLS 1.3. For more information regarding wolfSSL performance or usage of PSK, please contact facts@wolfssl.com. Recently, wolfSSL released version 4.0.0 of the wolfSSL embedded SSL/TLS library. This new version includes many new port/feature additions, maintenance updates, and a couple bug fixes. Among those new feature additions includes multiple new API added to wolfSSL's OpenSSL compatibility layer! The compatibility layer is a series of commonly used and essential API that users can utilize to transition from OpenSSL to wolfSSL. The function names are redefined as their wolfSSL counterparts, which have similar signatures and output to their OpenSSL counterparts. wolfSSL also provides support for TLS 1.3! More information can be found here: https://www.wolfssl.com/docs/tls13/. wolfSSL is available for download at the wolfSSL download page here (https://www.wolfssl.com/download/), or through a git-clone of the wolfSSL repository here (https://github.com/wolfssl/wolfssl.git). For more information about wolfSSL or porting from OpenSSL, please contact facts@wolfssl.com. wolfSSL is at LinuxFest Northwest (LFNW) this year! Bellingham Linux Users Group and the Information Technology department at BTC co-produce this annual Open Source event in Washington state. Attend presentations and exhibits on free and open source topics as well as Linux distributions and applications, InfoSec and privacy. For 2019, LFNW will be located in Bellingham, WA. More information about LFNW can be found here: https://linuxfestnorthwest.org/conferences/2019. At wolfSSL, we currently have a wolfSSH port to µC/OS-III in the works! µC/OS-III is a highly portable and scalable real-time kernel. Designed for ease of use on a huge number of CPU architectures, these kernels are a key component of the µC/OS real-time operating system. The features of this kernel allow it to pair nicely with the wolfSSH SSHv2 library, resulting in the maximization of the best possible encryption, speed, and strength while simultaneously allowing for minimal resource usage. Other features that are readily available and currently supported by wolfSSH include SCP, SFTP, client authentication via RSA keys or passwords, and more! For more information not included, please contact facts@wolfssl.com. wolfSSL is at wolfSSL at IoT Tech Expo Global this year! IoT Tech Expo Global is the world’s largest IoT conference series, covering the latest innovations within the IoT and how they impact industries such as Manufacturing, Transport, Supply Chain, Insurance, Logistics, Government, Energy and Automotive. This year’s key topics include smart building and facilities management, building the connected supply chain, smart city and transport management, smart grid data management and analytics, delivering smart connected new products, and much more. For 2019, IoT Tech Expo Global will be held in London, England. In cryptography and encryption, timing can be an unconsidered element of the security for various operations. However, if an encryption library is built without considering timing or the possible attacks that a malicious agent could execute with timing attacks, then that encryption library could be vulnerable to multiple different attacks that have occurred or can occur. An actual timing attack requires the agent to precisely time the logical operations performed by a CPU or other device, and by measuring these times is able to construct the sensitive data that was used to perform these operations. These kinds of attacks are even practical against well known, generally secure algorithms including RSA, DSA, and other signature algorithms. For more information about the wolfSSL embedded SSL/TLS library or other security features offered, please contact facts@wolfssl.com. wolfSSL also supports TLS 1.3! Significant changes from TLS 1.2 have been made in TLS 1.3 that are targeted at performance. This is the second part of six blogs discussing the performance differences observed between TLS 1.2 and TLS 1.3 in wolfSSL and how to make the most of them in your applications. This blog discusses the performance differences with regard to full handshake with server authentication using certificates. Let’s start with a look at the TLS 1.2 full handshake performing server-only authentication with certificates below. A TLS 1.3 full handshake (without HelloRetryRequest) performing server-only authentication with certificates is below. Notice that there is one less round trip until Application Data can be sent in TLS 1.3 as compared to TLS 1.2. This significantly improves performance especially on high latency networks. But, there is another source of performance improvement arising from the ordering of the handshake messages and when lengthy cryptographic operations are performed. 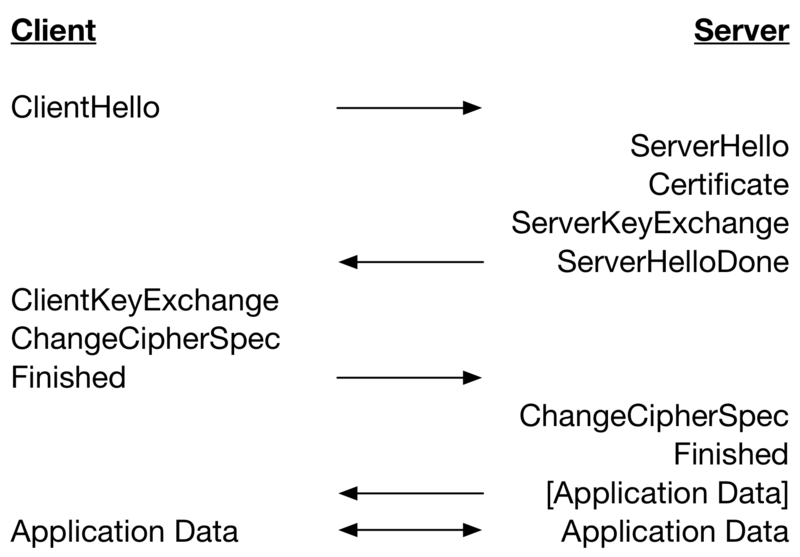 In the TLS handshake, the server waits on the ClientHello and then sends handshake messages as it produces them in separate packets. When packets are sent is dependent on the amount of processing required to produce the data. For example, to copy a chain of certificates into the Certificate messages is quick, while generating a TLS 1.2 ServerKeyExchange message is slow as it requires multiple public key operations. The client receives the messages at various time deltas and also requires differing amounts of processing. For example, the Certificate message is likely to require at least one signature verification operation on the leaf certificate. This asymmetric processing of messages means that some handshake messages will be processed on arrival and some will have to wait for processing of previous messages to be completed. 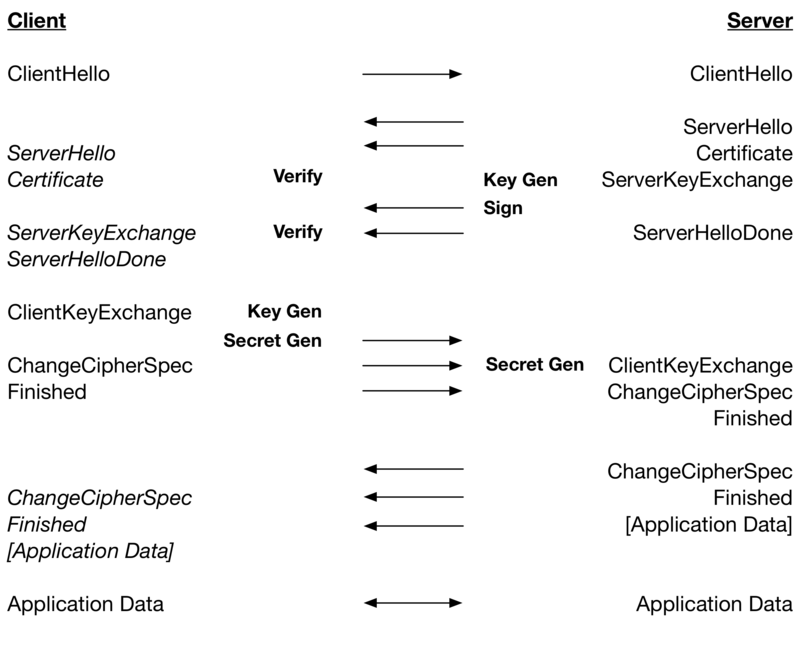 The table below restates the TLS 1.2 handshake but includes processing of messages and the major cryptographic operations that are performed. Operations are on the same line if the they are performed at the same time relative to network latency. 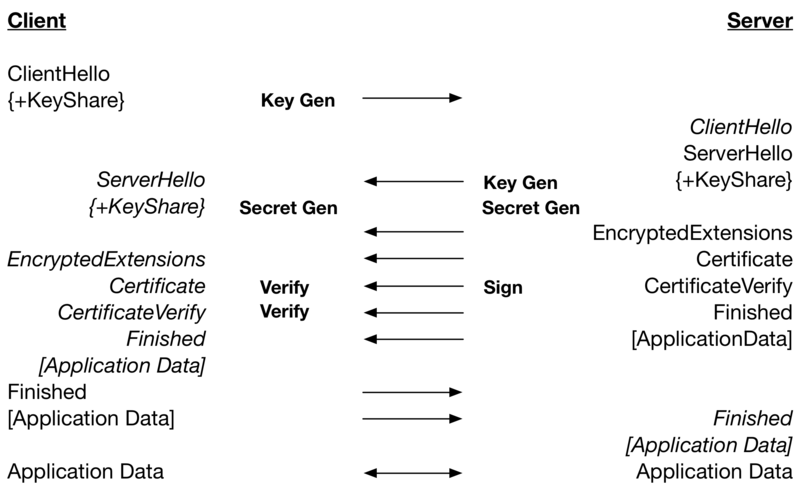 From this we can see that for RSA, where Verify is very fast relative to Sign, a TLS 1.2 handshake is dependent on: 2 x Key Gen, 2 x Secret Gen, 1 x Sign and 1 x Verify. For ECDSA, where Verify is slower than Key Gen plus Sign: 1 x Key Gen, 2 x Secret Gen and 2 x Verify. 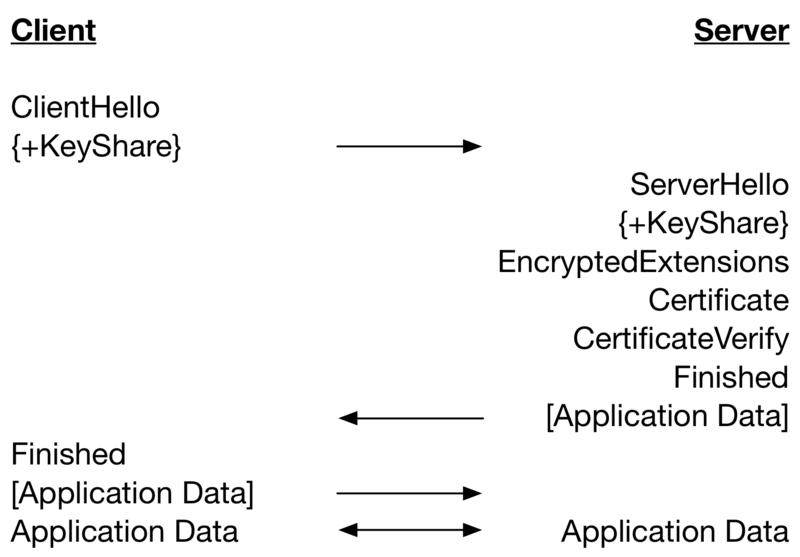 The table below is a restating of the TLS 1.3 handshake including processing of message and the major cryptographic operations. From this we can see that a TLS 1.3 handshake with RSA, where Verify is a lot faster than Sign, is dependent on: 2 x Key Gen, 1 x Secret Gen, 1 x Sign. Therefore, a Secret Gen and Verify in TLS 1.2 are saved. For ECDSA, where Verify is a lot slower than Sign, the TLS 1.3 handshake is dependent on: 2 x Key Gen, 1 x Secret Gen, 2 x Verify. 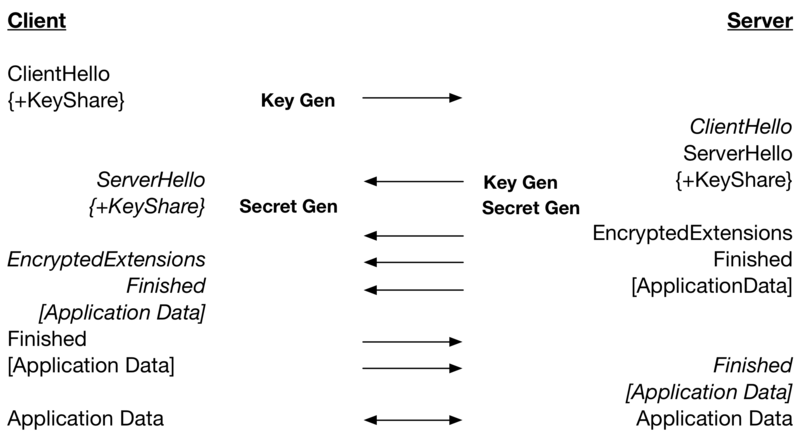 Therefore, a Secret Gen in TLS 1.2 is traded for a faster Key Gen.
Running both the client and server on the same computer results in about a 15% improvement in the performance of ephemeral DH with RSA handshakes – mostly due to the parallel operations. With ephemeral ECDH and RSA there is about a 6% improvement, and with ECDHE and ECDSA there is about a 7% improvement – mostly due to the saving in round-trips. These improvements come for free when using TLS 1.3 without the HelloRetryRequest. The next blog will discuss handshakes using pre-shared keys. For more information regarding wolfSSL and the TLS 1.3 full handshake, please contact facts@wolfssl.com.